The labels can be washed (dishwasher or clothes washer), bleached, machine dried and dry-cleaned. The normal life of a garment is 50 washings. These labels have been tested to ensure they will be readable for at least that long. These labels must be attached to the item in a location where they will be flat when scanned. For obvious reasons, when applied to clothing, they should not be visible when the garment is being worn or placed where they will scratch the person wearing the garment. Put the label on the tail of a shirt (front or back); or on a pocket or an inside waistband on pants or skirt. If the label is on an item that goes through the dishwasher, we recommend using a hot glue gun. The labels can be attached to garments using heat-fused fabric adhesive (“Stitch Witchery” or equivalent), but this is not recommended because in our tests, the adhesive gave up after about 15 washings. Labels that are floating loose in the washer aren’t much use to anyone. It is possible to sew the labels along one edge and then use Stitch Witchery under the rest of the label. That way, if the Stitch Witchery gives up, the label will still be attached and you’ll be able put more Stitch Witchery under the label and re-bond it. The labels do not stretch; when attaching a label to something that stretches, place it where this won’t matter. Many dry-cleaners will sew these labels. We have found the average price for this is about 25 cents. 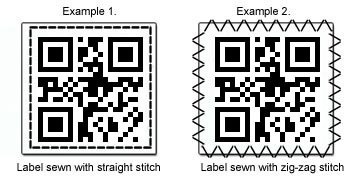 Click here for a copy of these instructions to give to the person who will sew the labels on. The labels must not be folded. Folding the edges under will make them too wavy to be read. Sew them so that they are flat. It is important that no printed part of the label be sewn through – sew around the edge. The extra white portion where there is no code can be trimmed.